One of the most intriguing and recognized figures of the twentieth century conducts a masterclass in subversion Originally published in 1906, The Right Way to Do Wrong was a masterclass in subversion conducted by the world’s greatest illusionist. 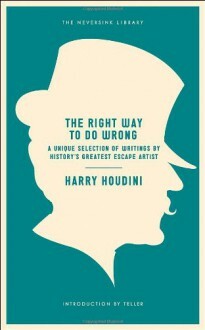 It collected Hou­dini’s findings, from interviews with criminals and police officers, on the most surefire ways to commit crime and get away with it.This volume presents the best of those writings alongside little-known articles by Houdini on his own brand of deception: magic. Revealing the secrets of his signature tricks, including handcuff and rope escapes, and debunking the methods of his rivals, he proves himself to be just as clever and nimble a writer as he was a magician—and surprisingly free with trade secrets! All of which makes this unique selection of works both the ultimate anti-etiquette guide and proof that things are not always as they seem.In an exclusive introduction to this volume, Teller—magician, comedian, and silent sidekick of Penn Jillette—speaks up about the greatest magician of modern times.